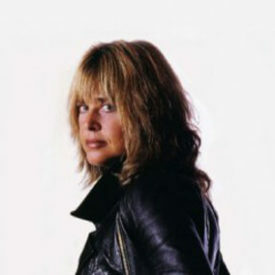 It’s pretty far-fetched, as some revisionists are now claiming, to view Suzi Quatro as a precursor to the “Riot Grrrls” of the 1990s. Her brand of mid-1970s glam pop was far more innocuous and, in any case, often supplied by professional songwriters. What she did prove was that it was possible for a petite woman to play bass, sing, and wear leather with a reasonable degree of raunch and pride. That, with enough musical hooks to draw in the teen pop crowd, was enough to reel off a series of big British hit singles just before the advent of punk, although she remained virtually unknown in her native U.S.
To the British audience, it seemed as if Quatro emerged out of nowhere in 1973, but in fact she’d been playing professionally for nearly a decade. While still in her early teens, she joined the Pleasure Seekers, a Detroit band also featuring her sisters Arlene and Patti. One of the few all-girl garage bands who played their own instruments, they recorded a fine, gritty single for the local Hideout label, Never Thought You’d Leave Me / What A Way To Die (both sides were reissued in the 1980s on the What A Way To Die ’60s garage compilation). Another single followed for Mercury, and the group even toured Vietnam to entertain troops. In 1968, though, Arlene quit the band to raise her kids (one of whom is actress Sherilyn Fenn), to be replaced by yet another sister, Nancy. The Pleasure Seekers became Cradle, which placed more emphasis on hard rock and original material. In the early 1970s, British producer Mickie Most (The Animals, Lulu, Donovan, Herman’s Hermits) happened to see Cradle while he was in Detroit to work on an album with Jeff Beck at Motown’s studios. Most let Quatro know he was interested in working with her as a solo act; six months later, Cradle split, and Suzy was on her way to London (Patti joined the all-woman rock band Fanny in Los Angeles). After her first single flopped, Most hooked her up with songwriters Mike Chapman and Nicky Chinn, who were also supplying material to the Sweet. The Chapman-Chinn-penned Can The Can went to number one in the U.K. in 1973, and over the next few years the same team would write about ten other British chart hits for her, including four Top Ten entries. These fused glitter and bubblegum in much the same way as the Sweet did, though Quatro was perhaps a tad raunchier (without ever getting downright scary). Quatro and her guitarist (and husband) Len Tuckey did write some of her material, though these efforts were usually confined to albums. In the U.S., though, she could barely get into the Top 100, though she did get on the cover of Rolling Stone. Her American fortunes changed in the late 1970s, when she had a short-lived, semi-regular stint on the sitcom Happy Days as the guitar-playing, sassy Leather Tuscadero. In 1979, she made the American Top Five with Stumblin’ In , although this was a duet with Chris Norman. 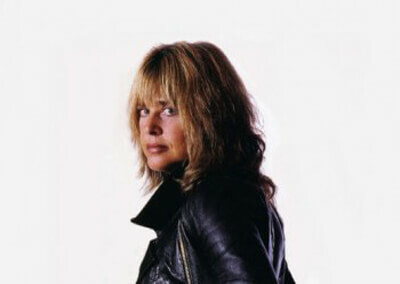 Undoubtedly an influence upon the Runaways and Joan Jett, and thus by extension a mild influence on a subsequent generation of female rockers, she’s kept a low profile in the 1980s and 1990s, although she’s done some television and theatrical work in Britain.